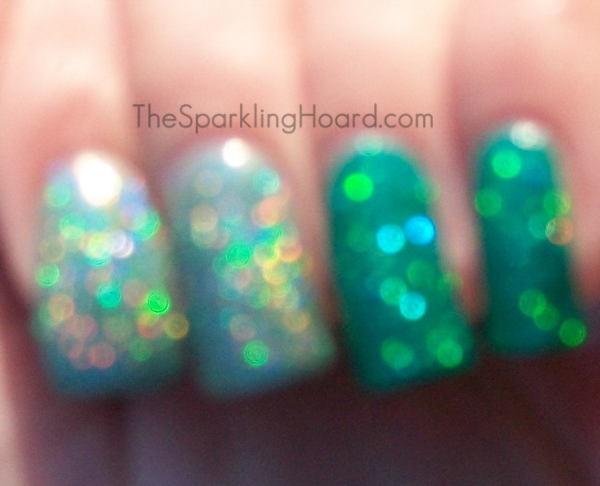 Orly Sparking Garbage consists of a very sheer, pale teal base that's jam-packed with holographic microglitter. It dries quickly and reaches full opacity in 3-4 coats (I used 3). The formula is great. Color Club Holiday Splendor features a deep, rich, bright teal base filled with small holographic glitter. Dry time is average and it reaches full opacity in 2 coats. The formula was fine. I was kind of scrambling to get these photos done before sunset, so the lighting isn't the best. Sparkling Garbage is on the left, Holiday Splendor is on the right! Sparkling Garbage is much more sparkly than Holiday Splendor because Holiday Splendor's dark base prevents light from reaching the glitter. The glitter in Sparkling Garbage is also smaller and more plentiful than the glitter in Holiday Splendor. Additionally, Sparkling Garbage is a much lighter shade of teal and has an almost icy feel to it. They're definitely not dupes! If I could only have one, I would pick Sparkling Garbage. Orly Sparkling Garbage costs about $8 for 18mL and can be found at stores like Sally Beauty Supply and Ulta. It's limited edition, so if you want it, grab it while the Mash Up collection is still in stores! Also, if you buy it from Sally Beauty Supply, you're entitled to a free sample of Orly's new cuticle oil, so be sure to ask your cashier about that! To stay up-to-date on the latest Orly collections, Like their Facebook page. Color Club Holiday Splendor was a limited edition holiday polish and is no longer available in stores. To stay up-to-date on Color Club news, Like their Facebook page. So what do you think? Which one would you pick?